Time Resolved Photo-Luminescence (TRPL) is an experimental technique that provides the spectral and temporal evolution of the emission of a sample following its illumination by a short pulse of light. More precisely, the short pulse of light generates electron-hole pairs that decay to lower energy levels of the sample. These electron-hole pairs can subsequently recombine and emit light. The emitted light is composed of a set of wavelengths corresponding to transition energies of the sample and, as a result, the measurement of the optical spectrum as a function of time provides a means to measure the transition energies and their lifetimes. Since these decay times are on the order of picoseconds or nanoseconds, and the intensity of light emitted can be very weak, a conventional spectrum analyser cannot provide the resolution required. Instead, it is necessary to use a device known as a streak camera. Fig. 1.1: Schematic diagram of a streak camera. Click for larger image. Fig. 1.2: Schematic diagram of the experimental setup for TRPL spectroscopy. The streak camera is an ultra-high-speed detector which captures light emission phenomena occurring in extremely short time periods. The operating principle is shown in Fig. 1.1. The light pulse to be measured is projected onto the slit and is focused by a lens into an optical image on the photocathode, able to cover a wavelength range between 300 nm and 1500 nm. Here, the photons are converted into a stream of electrons proportional to the intensity of the incident light. As the electron stream created from the light pulse passes between a pair of sweep electrodes, a time-varying voltage is applied to the electrodes, resulting in a high-speed sweep. This means that the early part of the pulse is deflected less than the later part of the pulse, so that different parts of the pulse strike the micro channel plate (MCP) at different positions. Thus the temporal structure of the pulse is converted into a spatial distribution, or ‘streak’, pattern. As the electrons pass the MCP, they are multiplied several thousands of times and are then bombarded against the phosphor screen, where they are converted back into light. The fluorescence image corresponding to the early part of the incident light pulse is positioned at the top of the phosphor screen, with later parts positioned in descending order; in other words, the axis in the perpendicular direction on the phosphor screen serves as the temporal axis. The brightness of the fluorescence image is proportional to the intensity of the corresponding incident light pulses and the position in the horizontal direction on the phosphor screen corresponds to the wavelength of the incident light. To perform TRPL experiments, the sample under investigation is mounted on a cold finger in the vacuum cell of a closed cycle helium cryostat (operating from 7 K to 300 K), and is illuminated with very fast (picosecond or femtosecond) laser pulses. The optical response is then collected by a microscope objective and is sent to the entrance slit of an imaging spectrograph, directly connected with the input optic of a streak camera. An overall picture of the schematic experimental setup is depicted in Fig. 1.2. Fig. 1.3: (a) Schematic of carrier dynamics in an InGaAs/GaAs quantum well. (b) The resultant streak image. The typical spectrum collected by a TRPL experiment is called a streak image. It depicts the intensity of the optical response of the sample (colour scale) as a function of the wavelength (horizontal axis) and the time (vertical axis). The example of Fig. 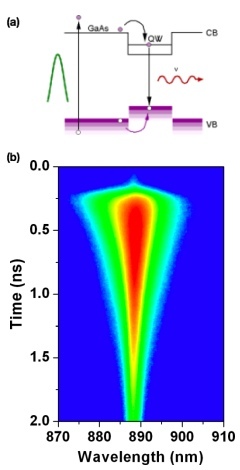 1.3(a) concerns the emission dynamics of an InGaAs/GaAs quantum well (QW) at 8 K. A 780 nm laser pulse excites the InGaAs QW above the band gap of the material (~890 nm at this temperature), generating photo-carriers in the GaAs barrier. From here they flow into the well, and recombine to emit light. As the number of carriers is depleted, the intensity of the emitted light decays, as is evident in the streak image (Fig. 1.3(b)). The carrier dynamics occurring during these processes provides not only information about the position of the peak emission, as in a normal PL experiment, but also the lifetime of the excitons involved in the recombination. In fact, considering vertical (Fig. 1.4(a)) or horizontal (Fig. 1.4(b)) cuts of the streak image, the trends of the intensity of the emission as a function of time or wavelength, respectively, can be extracted. In this particular example, for InGaAs/GaAs QW, the peak position is measured at 888 nm and the decay time, after a single exponential fitting, is estimated to be 0.7 ns. Fig. 1.4: Plots extracted from the streak image of Fig 3; (a) Intensity versus time at 888nm, (b) Intensity versus wavelength at 0.5ns.